The radio galaxy M87 viewed at radio wavelengths at different scales, successively zooming into smaller structures in the jet emerging from the supermassive black hole at the core of the galaxy. The two bubbles visible in the larger image span about 80 kpc and show two back-to-back jets, one ending in a pair of edge-brightened lobes, the other starting to twist after a few kpc. At higher resolution and in the central region, only this jet is visible, down to scales of a fraction of a parsec. Source: Frazer Owen (NRAO), John Biretta (STScl) and colleagues. In 2003, the HEGRA collaboration (Aharonian et al. 2003) reported first indications of very-high-energy (VHE) gamma-ray emission from the giant elliptical galaxy M87. New H.E.S.S. results reported in October 2006 confirm with high significance that M87 is indeed a VHE gamma-ray source (Fig. 1), and in addition brought the surprising result that the gamma-ray flux varies on a scale of days (Fig. 2).M87 is an active galaxy at about 16 Mpc distance, hosting at its core a supermassive black hole of about 3 thousand million solar masses (derived from the rapid rotation of gas circling the black hole byMacchetto et al. (1997)). A pair of jets - plasma streams - emerges from the region of the black hole, with one jet visible in radio images on scales ranging from sub-parsec to some 10 kpc (top figure). M87 stands out as a VHE gamma ray source, since all other extragalactic gamma-ray sources discovered so far are of the blazar type, where a jet points directly towards Earth and is viewed head-on. Shock waves in this jet are believed to accelerate particles radiating gamma rays; the highly relativistic motion of the jet collimates the gamma-rays, boosts them in energy, and effectively makes them detectable with current instruments. In M87, the jet is obviously not pointing straight towards Earth, and such relativistic beaming effects can only play a minor role. The exact angle at which the jet is launched is hard to determine; from the observation of superluminal motion of blobs in the jet within a few arc-seconds from the black hole,Biretta et al. (1999) concluded that the angle cannot be larger than 19 degr. Why is the fast variability of VHE gamma-rays from M87 so interesting? Polarized radio emission (Perlman et al., 1999) and as well as X-rays (e.g.Marshall et al. 2002,Wilson and Yang 2002, and alsoChandra M87 pages) from the jet indicate the presence of synchrotron-radiating high-energy electrons, which could also be the source of high-energy gamma rays, and fast variability of gamma-ray emission is common among blazar jets. However, in blazar jets a combination of small source size and large relativistic Doppler factors combine to create rapid variability, the latter speeding up perceived variability time scales by factors as large as 50. In case of M87, where the jet is not viewed head-on, such relativistic effects should be modest. Then, the gamma-ray source cannot be larger than a few light-days, otherwise the difference in travel time of gamma rays between the front and rear parts of the source volume would smear out any rapid variation. 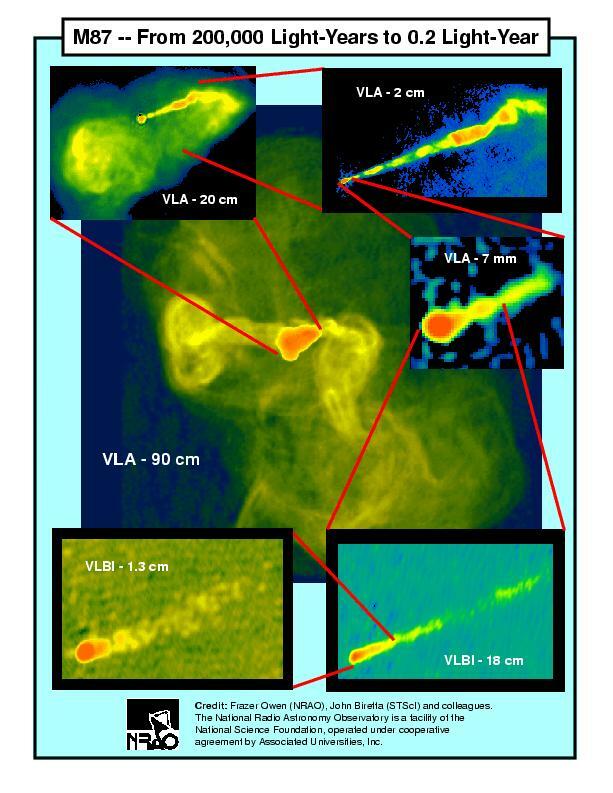 The smallest structures in the extended jets ("knots", see the "VLA 2 cm" and "VLA 7 cm" panels in the top figure and the Chandra X-ray images), on the other hand, are believed to have a size of at least a few light-months, and indeed the variability seen in the optical (Perlman et al. 2003) and X-rays (e.g.Harris et al. 2006) is on months scale. 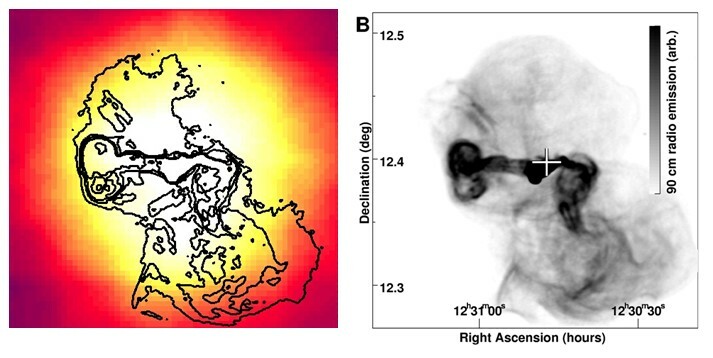 In 2004/05, simultaneously with the peak of the VHE gamma ray emission, the so-called HST-1 knot in the jet showed a year-long X-ray outburst (Harris et al. 2006), but it is hard to see why gamma-rays from this knot should vary so rapidly. The most plausible compact source of rapidly varying VHE gamma rays is the immediate vicinity of the black hole at the core of M87, with its Schwarzschild radius of about 10 light-hours, implying that the gamma-rays now allow to probe particle acceleration in this environment. Speculative novel mechanisms may be at work there. Rapidly rotating black holes embedded in external magnetic fields can generate electric fields and accelerate protons to ultra-high energies; curvature radiation from these protons results in high-energy gamma rays (Levinson, 2000). More conventional leptonic (Band and Grindlay, 1986) and hadronic (Protheroe et al. 2003,Reimer et al. 2004) mechanisms are not excluded, although models discussed so far tend to generate energy spectra with a higher spectral index than the observed photon index of 2.2...2.6. An interesting issue is if VHE gamma rays, once produced, can escape from the vicinity of the black hole, an environment with high radiation density where gamma-photon collisions may result in electron-positron pair production and absorption of the gamma-rays. In blazar modeling, this is a serious constraint which can only be resolved by resorting to the highly relativistic motion of the jet, which enhances radiation by beaming and Lorentz boost and which allows more modest energy densities in the rest frame of the jet. However, the black hole in M87 has a rather low luminosity, well below the maximum possible (Eddington) luminosity, and its environment seems sufficiently transparent for gamma rays. Apart from a modest rate of infall of matter into the black hole, an advection-dominated accretion disk (i.e. a disk with low radiative efficiency) could explain the modest radiation levels. Hence, in M87 several favorable factors - proximity, large black hole mass combined with relatively low luminosity - combine and allow us to probe the central engine of this active galaxy using VHE gamma rays. Fig. 1: Left: gamma-ray intensity in the region of M87. The statistical significance of the gamma-ray signal is 13 standard deviations. The black contours indicate the radio image (Owen et al. 2000). The extent of the gamma-ray signal - about 0.1 degr. - is compatible with the point spread function of H.E.S.S., indicating that gamma rays come from a source which appears pointlike for H.E.S.S; the upper limit for the source size is 14 kpc. Right: superimposed on the radio image, the cross indicates the centroid of the gamma-ray signal. Fig. 2: Gamma ray flux above 730 GeV as a function of time. The lower panel shows the H.E.S.S. 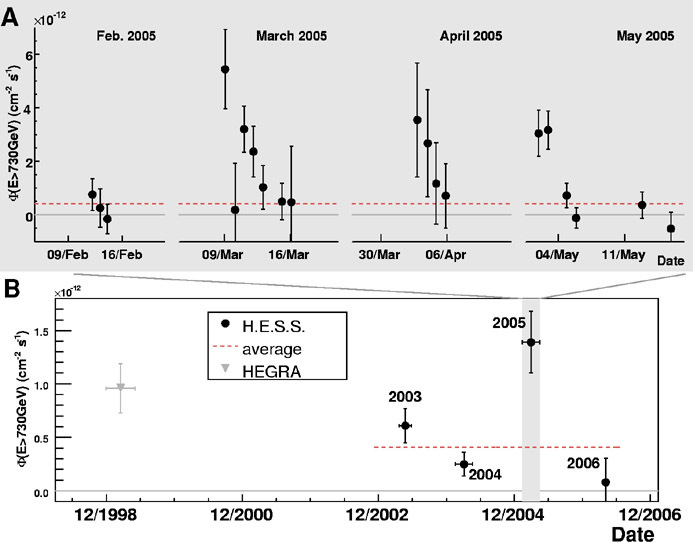 annual average flux for the years 2003 to 2006 together with a HEGRA data point for 1998 (Aharonian et al. 2003). The upper panel shows the night-by-night fluxes measured in February to May 2005, exhibiting significant flux changes on time scales of 1-2 days.